and the FREE Insider's Guide to Italy in your email! Travel Agents go here to request brochures. I also prefer to have brochures mailed to my home. Your requested materials will arrive shortly. Applies to: PerilloTours.com, ItalyVacations.com and LearningJourneys.com (as well as other site owned by the Perillo Family of Companies). 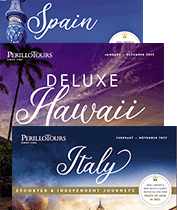 Welcome to the Perillo Tours' Family of Websites (the 'Website' or 'Websites'). These Websites are provided solely to assist customers in gathering travel information, determining the availability of travel-related goods and services, making legitimate reservations or otherwise transacting business with travel suppliers, and for no other purposes. The terms 'we', 'us', 'our' and (respectively) 'ItalyVacations,' 'Perillo Tours,' and 'Learning Journeys' refer to Perillo Tours' Websites. The term 'you' refers to the customer visiting the Website and/or booking a reservation through us on these Website, or through our customer service agents. This Website is offered to you conditioned upon your acceptance without modification of all the terms, conditions, and notices set forth below (collectively, the 'Agreement'). By accessing or using this Website in any manner, you agree to be bound by the Agreement. Please read the Agreement carefully. If you do not accept all of these terms and conditions, please do not use this Website. Be sure to return to this page periodically to review the most current version of the Agreement. We reserve the right at any time, at our sole discretion, to change or otherwise modify the Agreement without prior notice, and your continued access or use of this Website signifies your acceptance of the updated or modified Agreement. As a condition of your use of this Website, you warrant that (1) you are at least 18 years of age, (2) you possess the legal authority to create a binding legal obligation, (3) you will use this Website in accordance with this Agreement, (4) you will only use this Website to make legitimate reservations for you or for another person for whom you are legally authorized to act, (5) all information supplied by you on this Website is true, accurate, current and complete, and (6) if you have an account on any of our Websites, you will safeguard your account information and will supervise and be completely responsible for any use of your account by anyone other than you. We retain the right at our sole discretion to deny access to anyone to this Website and the services we offer, at any time and for any reason, including, but not limited to, for violation of this Agreement. (1) use this Website or its contents for any commercial purpose; (2) make any speculative, false, or fraudulent reservation or any reservation in anticipation of demand; (3) access, monitor or copy any content or information of this Website using any robot, spider, scraper or other automated means or any manual process for any purpose without our express written permission; (4) violate the restrictions in any robot exclusion headers on this Website or bypass or circumvent other measures employed to prevent or limit access to this Website; (5) take any action that imposes, or may impose, in our discretion, an unreasonable or disproportionately large load on our infrastructure; (6) deep-link to any portion of this Website (including, without limitation, the purchase path for any travel services) for any purpose without our express written permission; or (7) 'frame', 'mirror' or otherwise incorporate any part of this Website into any other website without our prior written authorization. Perillo Tours Always Attempts To Do Our Best to Protect Your Privacy! As a welcome visitor to ItalyVacations.com, PerilloTours.com or LearningJourneys.com (and/or other sites connected to the Perillo Tours' Family of Websites), you have free access to our extensive database on Italy travel options so you can research and make purchases for your next Italian vacation. You can benefit here from the latest travel information and the expert knowledge we've developed during decades as a world-leading tour operator. Unless you want to purchase something on the site or receive our E-mail newsletter, User Registration is optional, but helpful so we can customize the content of the Website to better meet your specific needs and improve our products. Users are encouraged to complete our Contact Information form and Sign up Preferences. Contact information: first and last name, address, telephone number, E-mail address and a personal identifier and password. The Sign up Preferences section allows the member to subscribe to our E-mail newsletter, to receive updates from us about special offers, new services, money-savings E-mail and to participate in our Online Community. However, you may always decline to receive these e-mail messages. Please see our Opt Out policy described below. In order to book via PerilloTours.com, ItalyVacations.com or LearningJourneys.com user registration information needs to be supplemented by the following passenger information (first and last name of travelers), delivery information (name, mailing address, day and alternate phone number, E-mail address) and credit card information (card type, number, expiration date, cardholder's name, billing address). This information is used for billing purposes and to fulfill your travel reservations. It also allows us to contact you for customer service if there should be difficulty with processing your reservation or any change in plan or schedule. In addition, your E-mail address is collected to send you an E-mail message confirming the reservations you request online. If a user rejects the cookie, they will be able to use the information section and the planning feature but will have to register first whenever wishing to purchase. Cookies enable us to track and target the interests of our users to enhance the experience on our site. We collect IP addresses only to obtain various types of statistics about our Website usage such as the most frequently requested pages and paths followed as well as other system administration tasks. When you reserve or purchase travel arrangements through the Perillo Tours' Family of Websites, we provide some information about you (such as name) to the airline, hotel, car rental company or other third parties involved to ensure the successful fulfillment of your travel arrangements. We do not sell, or dispense for our profit or the profit of others, individual customer names or other private profile information to third parties. Occasionally, will hire a third party to act on our behalf for projects such as market research surveys and/or contest entry processing and will provide information to these third parties specifically for use in connection with these projects. The information we provide to such third parties is protected by a confidentiality agreement and is to be used solely for completing a specific project. However, the sharing of personal information to airlines and hotels is necessary to provide travel arrangements. Perillo Tours e-mail newsletters, special offer e-mails and site and service update e-mails are sent to interested customers and site-visitors to provide the latest news about our services. Your personal e-mail address is needed to subscribe to any of our specifically electronic mailings. E-mail newsletters and special offer E-mails provide news about your favorite places or update you with information concerning the tours and destinations for which you expressed interest. Sites and services update E-mails inform a user on new functionalities of the site. However, you may always decline to receive these E-mail messages by replying and typing 'unsubscribe' in the subject line of the E-mail. Please see our Opt Out Policy described below. You can reply to the e-mail and type 'unsubscribe' in the subject line of the E-mail. Subscribers may also correct or update information, previously provided, via the same channels. From time-to-time Perillo Tours will organize or sponsor contests to give members the opportunity to win great prizes including travel-related prizes. We might also request information from users via surveys. Participation is completely voluntary and users therefore have a choice whether or not to disclose this information. Information requested may include contact information (such as name and shipping address), and demographic information (such as zip code and age group). Contact information will be used only to notify the winners and award prizes. Survey information will be used for purposes of monitoring and improving the use and satisfaction with the Website. Our users are given the opportunity to 'Opt Out' of having their information used for purposes not directly related to our Website at the point where we ask for the information. This Website contains links to other sites. Please be aware that Perillo Tours is not responsible for the privacy practices of such other sites. We encourage our users to read the privacy statements of any web site that collects personal identifiable information. The Perillo Tours' privacy statement applies solely to information collected by the Perillo Tours' Family of Websites. This Website takes every precaution to protect our users' information. When users submit sensitive information via the Website, their information is protected both online and off-line. Your credit card transaction will be authorized through a credit card processor. All information you provide to Perillo Tours is transmitted using SSL (Secure Socket Layer) encryption. SSL is a proven coding system that lets your browser automatically encrypt and scramble data before you send it to us. While on a secure page, such as our order form, the lock icon on the bottom of Web browsers such as Firefox and Microsoft Internet Explorer becomes locked, as opposed to unlocked, or open, when you are just surfing. You may also double check if the address line shows 'https:' to make sure that you are currently on a secure page. While we use software encryption to protect sensitive information online, we also do everything in our power to protect user-information offline. All of our users' information, not just the sensitive information mentioned above, is restricted to our offices and to offices of vendors contracted to us. Only employees who need the information to perform a specific job (for example, our billing clerk or a customer service representative) are granted access to personally identifiable information. All employees are kept up-to-date on our security and privacy practices. Any time new policies are added, our employees are notified and/or reminded about the importance we place on privacy, and what they can do to ensure our customers' information is protected. Finally, the servers used to store personal identifiable information are kept in a secure environment, behind a locked enclosure. If you have any questions about the security at our Website, please call us at 201-307-1234. If a user's personal identifiable information changes (such as zip code), if a user no longer desires Perillo Tours' services, or if a user simply wish to change their information, the Company will provide a way to correct, update or remove that user's personal data. If difficulty is encountered in doing this directly via the Website, this modification can always be done by e-mailing our Customer Support at by calling us at 201-307-1234. Perillo Tours may disclose member information if required to do so by law, court order, as requested by other government or law enforcement authority, or in the good faith belief that disclosure is otherwise necessary or advisable including, without limitation, to protect the rights or properties of Perillo Tours or when we have reason to believe that disclosing the information is necessary to identify, contact or bring legal action against someone who may be causing interference with our rights or properties, whether intentionally or otherwise, or when anyone else could be harmed by such activities. © 2019 Perillo Tours, Inc. All rights reserved.